Melbourne, 1941. Headstrong young Mae meets and falls head over heels in love with Harry Parker, a dashing naval engineer. After a whirlwind courtship they marry and Mae is heavily pregnant when she hears that Harry has just received his dream posting to HMAS Sydney. Just after Mae becomes a mother, she learns Harry's ship is missing. Surrounded by their friends and families, Mae and Grace struggle to keep hope alive in the face of hardship and despair. Then Mae's neighbour and Grace's boss Sam Barton tells Mae about a rumour that the Japanese have towed the damaged ship to Singapore and taken the crew prisoner. Mae's life is changed forever as she focuses her efforts on willing her husband home. 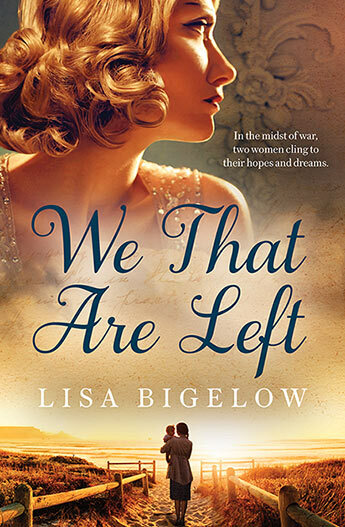 Lisa Bigelow's life revolves around story-telling. An avid reader from age five, her career as a journalist and communicator has been all building and delivering compelling stories about water resources, climate change and any issue that interests her audiences. She recently completed a Masters Degree in Communication and aims to use her writing to illuminate ongoing issues and make them accessible to a wide readership. We That Are Left is her first novel.